Share the post "Our Background"
Born in Laxou (54) in 1976 , his parents joined the town of Apt while Ludovic was only 1 year and a half . He studied at the “Lycée Professionnel” of Cavaillon. After his graduation, Ludovic went to work with Head Chef Francis Robin in Salon de Provence , then at the Chalet Mounier in Les 2 Alpes . Called to military service , he was appointed to cook for the General 3 stars and his staff based in Bosnia. 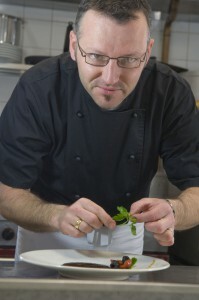 Back in France , he decided to settle in the little village of Sault and became Second chef at L’Hostellerie Val de Sault. Born in Vernon (27) in 1970, Jean-Michel is the only one in his family to work in the catering industry. In 1986, he joined the Professional College of Louviers, where he graduated in 1990. After his graduation, he went to work in a Michelin-starred restaurant on the Normandy coast, always eager to learn more, he traveled throughout France and develop his experience in wine. In 1997, he decided to go to England where he stayed seven years. Back in France in 2004, he returned to work in Sault, where he met Ludovic. The following year, he decided to do a partnership with Ludovic and they bought L’Oustau de la Font in 2005. Jean-Michel and Ludovic developed L’Oustau de la Font by transforming the “Little Village Bar” into a 3 star hotel, a popular restaurant, present on the Michelin guide, Guide su Routard, Gault Millau, as well as a superb selection of regional wine. In 2011, a new adventure arises, they buy the restaurant in the village of Montbrun les Bains, known today under the name L’O des Sources, which gives them a new challenge and develops the complementary aspect of these 2 locations with a wonderful panoramic view and separated by just 1.5 km. In 2015, they decided to combine the two restaurants, all catering has been moved to L’O des Sources, they offer simple dishes, carefully presented, develops a cellar and wine bar. Their advantage, to work on a range of varied menus, have the ability to accommodate groups in this “Chic Bistrot” completely redesigned!